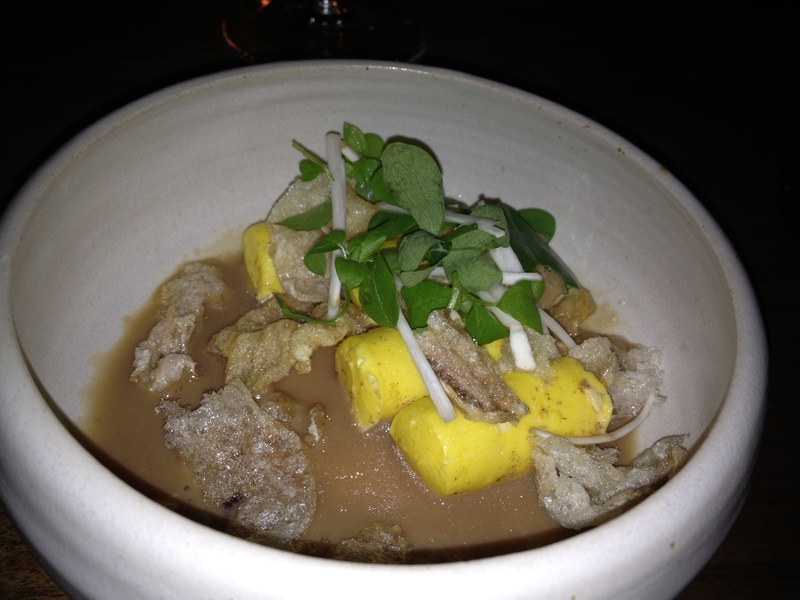 I loved my mid-December dinner at the newly-opened Suna. In fact, I had every intention of making a return visit in early spring. But when I read about a special ten-course dinner at Suna featuring guest chef’s including “Top Chef’s” Bryan and Michael Voltaggio, I kind of go nuts. Really nuts. Joining the stellar line-up of chefs are John Shields from the now-closed Townhouse, and Alex Talbot from Ideas in Food. I must find a way to attend. I immediately email Suna about a reservation. Then I call, heart pounding. No response, so I email again. I whine on www.donrockwell.com. This is followed by a day at work in which I pathetically carry my cell phone around in the hopes that I will get a call confirming my reservation. When the call actually arrives, you would think I had won the lottery rather than an opportunity to pay $175 for dinner. (At the end of the evening I will think that this is a bargain). Why am I devoting so much psychic energy to this event? I’ve had Bryan’s food on multiple occasions, including a recent visit to Range. 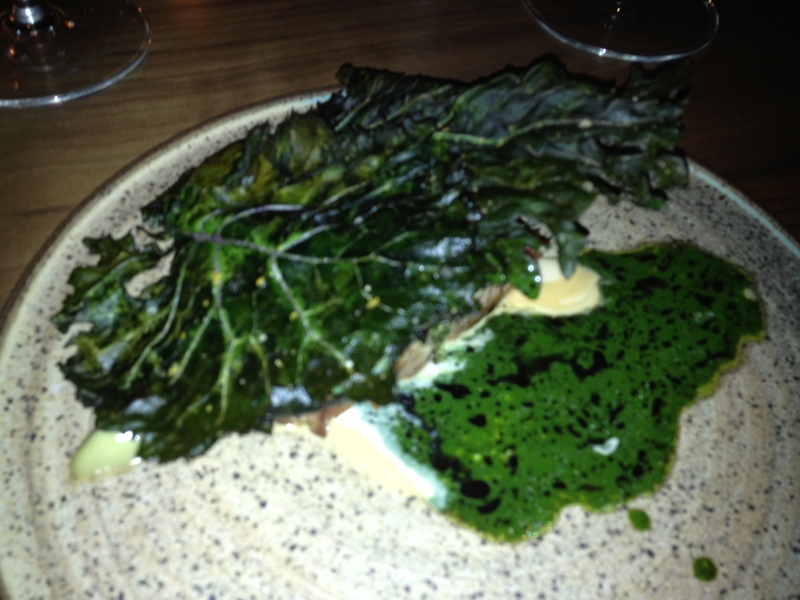 A few weeks ago I dined at Michael Voltaggio’s Ink in Los Angeles . The thought of experiencing the brothers’ food simultaneously thrills me. Plus, there is something about chefs helping out other chefs that I find so endearing. But the more I think about the fledgling Suna, the more I realize that attending the dinner is about demonstrating my desire to support the restaurant and Chef Johnny Spero. There is something special about Suna, and I seriously want it to succeed. I invite a co-worker to join me. She will be excited about the Voltaggio piece of the evening, but will also appreciate the beauty and understated elegance of Suna. It turns out that I’ve picked the perfect dining companion. She isn’t bothered by my inability to keep my eyes off of what’s happening in the kitchen. She has her back to the action, but I am giving her frequent updates. I am not going to go into great detail about the food during this dinner, since it is a one time event. I hope it will suffice to say that each and every course is a revelation. Without exception, we sigh appreciatively at the first bite of a dish. Moments later, as the flavors unfold, our smiles turn into grins. 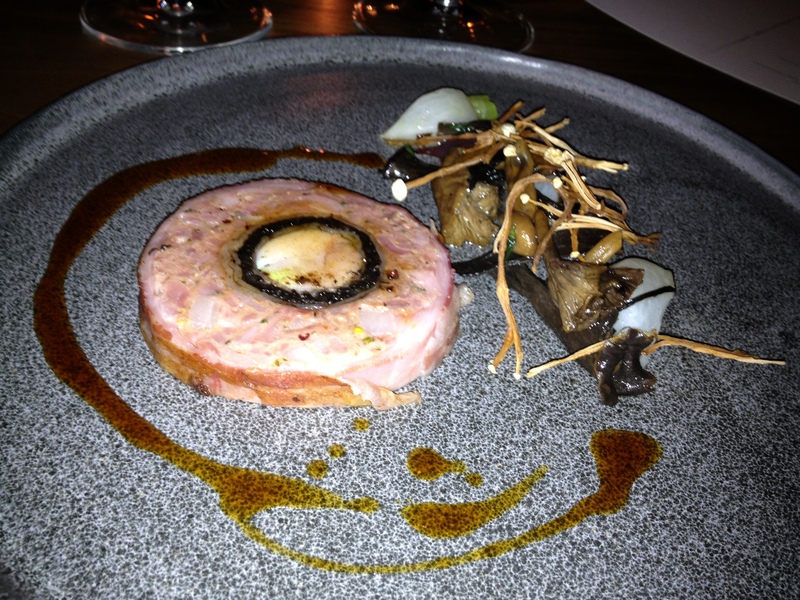 This is what exceptional food tastes like. We are also reacting to the impeccable service. We are absolutely astounded when general manager/sommelier Sean Alves welcomes me back, and then mentions that the wine pairings include an Albarino that I enjoyed on my first visit. What a wonderful way to make a return guest feel special and appreciated! We agree that the entire experience is like a piece of perfectly-orchestrated performance art, encompassing all of the senses. I ask Johnny Spero for a follow-up interview. I’m actually not clear about the goal for the dinner, and I hope to get his perspective on how things went. Spero tells me that the idea comes to him during a conversation with his mentor, Chef John Shields. Suna is flying under the radar and he wants to bring some visibility to the restaurant. 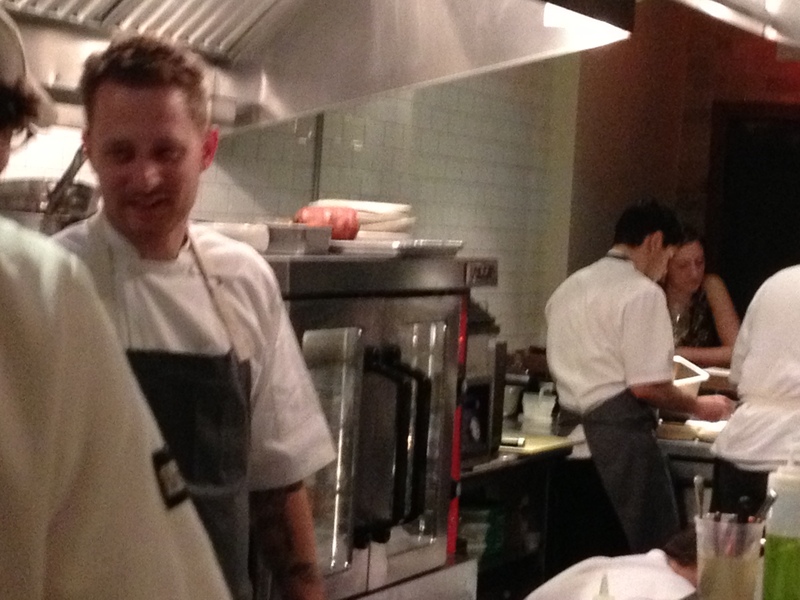 He reaches out to Bryan Voltaggio to participate. Bryan agrees and brings his brother along for the ride. Although the restaurant is still young, Spero says another reason for the dinner is for the challenge of doing something different. He finds it inspiring to work with other chefs in his own kitchen. All in all, he deems the dinner a success. I agree wholeheartedly. I begin the evening as an admirer of Suna. I leave hoping to help serve as an advocate. In terms of the future, I ask if Suna will be able to maintain its price for the tasting-menu-only format of the restaurant ($48 for four-courses, $78 for eight-courses). I consider this to be a bargain compared to many other local tasting menus. Spero says he has no intention of adjusting prices for now, “although more covers will make it more sustainable.” He hopes to expand his menu options at the counter overlooking the open kitchen and thinks “it will be fun to have more room to play with a larger format.” He’s also working on some new menu ideas, and will continue to adjust the menu in accordance with the changing seasons and availability of ingredients. I mention how impressed I am when my preferences from a recent visit are acknowledged. Spero explains Suna’s intentional focus on creating an exceptional experience for everyone, but repeat customers are key. Seating charts are maintained, notes are recorded, familiar faces are greeted warmly. 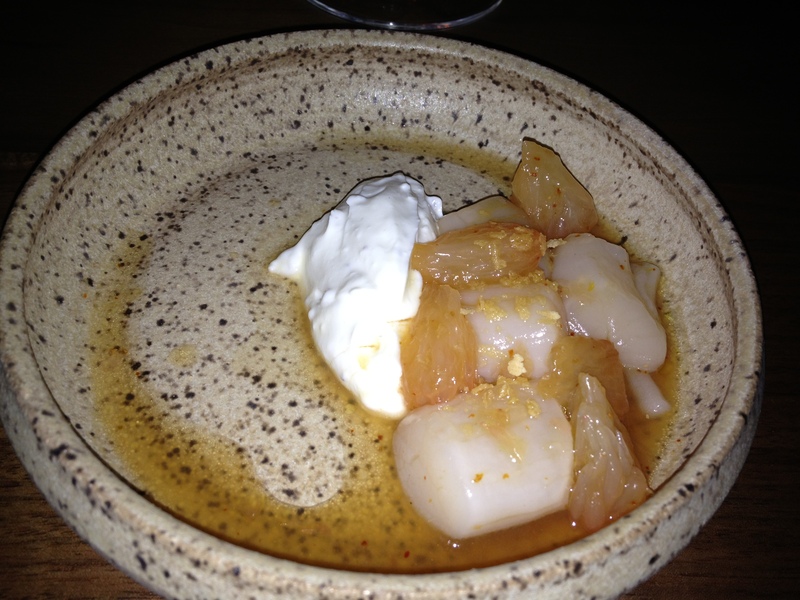 My Suna review from December 2012. My Ink review from January 2013.